And I love jeans and a tee. I really do. But there are some days when I don't want to look like I'm just wearing jeans and a tee again. And that's why I love simple, classic accessories. And when it comes to accessories, I am positively taken with the adorable pins made by Potter and Butler. Their pins are beautiful and simple and just the thing my daily uniform needs to look not quite so plain. Every flower pin made by Potter + Butler is completely hand-cut, stitched, constructed, fluffed, and made to order. These pins even come with clever names: Embellish, Norma and Minnie, that together make up the Potter and Butler Embellish Collection. And one of you is going to win the adorable three-member Embellish Family, which includes: one Lotta size Embellish, which measures 3 inches, one Norma size Embellish, which measures two inches, and one Minnie size Embellish, which measures 1.5”. To enter, go visit the Potter + Butler store and pick out something you like. While you're there, look at the incredibly cute party accessories they make too. The cake garland, pictured at the top, is simply one of the cutest things I've ever seen. • You may get a second entry by sharing the fun. Just grab the button to the right and put it on your blog or Facebook page. Leave a second comment letting me know that you did. • The winner will be posted on December 11. Once again, another nice holiday gift idea. That holiday pom is really cool! As for colors, I like the white and the mint. So beautiful! I love the red one, but they are all wonderful. 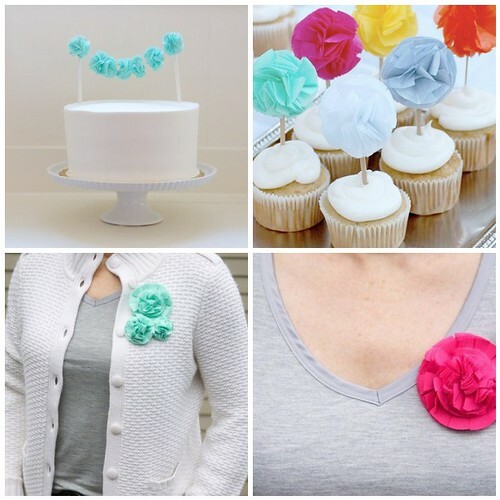 I never would have thought to dress up a plain t-shirt with these adorable accessories. I think I like the Peppy Toppers the best. Oh, I can see lots of uses for the Holiday Cheer! Great ideas. I love fabric flowers! I love the red one and the Holiday Garland is so cool too. What a great way to dress up a tee! I love the Embellish in Berry, I have a black shirt that it would look great on. The Peppy Toppers are mighty cute! The stylish one in our household is Marissa snd she doesn't let me forget it! I love the good fortune favors. I love the Norma Merry Pom! How cute is that? 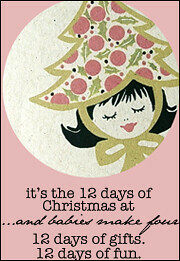 But, I love the idea of decorating a hat or purse with the three poms offered by this cute company! Love the Embellish Collection in Shadow and snow! What a great idea! I am a t-shirt and jeans gal too! I like the Goldie Embellish Collection. The good fortune favors are awesome too. Holiday Cheer Garland is fun! Oh, I love fortune cookies so much...so, the good fortune ones. Even though, I could sure use a "dress up" for my jeans, I just love the good fortune ones. Another win Kristi! Great find! I love the Lotta Pom and the snow embellishment! Love these!!! The garland is so beautifyl! Love the fabric floweres - shadow is my favorite! You have a way of finding everything I love and now I feel I must have the "snow flower". My t-shirts will feel bare without them ! I also put your button on my blog. I love the berry and mint, and the pins and ornaments are gorgeous! I love the berry colored Embellish lovies! Thank you for a chance to win some of these goodies! I love the embellish in berry. Everything is so pretty! I love the Gift Wrap Embellish Poms. What a cute way to jazz up a present. How neat! So great to dress up your look:) I heart them all, but the Embellish snow (well or berry) is my favorite(s). Sorry I couldn't just pick one! I love the ornaments. So cute! Love the embelish collection in shadow...I'm in a grey/black phase and these are just gorgeous!! Very pretty! Especially love Embellish Collection (Berry). I like the peppy toppers. We have a five year old birthday party in December, and these could be our party inspiration. I like the good fortune idea. It would be really clever for a baby shower or adoption shower with an Asian theme! Having fun checking out a few of your favorite things! You do wear jeans and a t everyday, with your cutie black buckle shoes! Love it. and you friend. :) Love the shadow Embellish trio too! What a fun gift idea! Love the embellish collection in shadow! I love the Peppy Toppers! They are adorable and such a great idea. I also like the Embellish Collection in gray and white (snow). I love the holiday garland and all of the Embellish group. Too much to choose from! The cupcake toppers are adorable too. Love the classic snow design... it would look great with all my bright ts & cardis!!! I love the berry collection...so cute! I like the gray embellish collection! Love the halloween cards. Always send ones to my family! love their site. The embellish collection is beautiful, but the lotta merry pom (and all the other poms) are simply stunning. Love the Berry trio myself. I hadn't thought of dressing up my jean/tee uniform...what a great idea! Cute! I like the embellish collections... and I'd chose berry. Wow, what a beautiful find! I love the pins that you featured but I also loved the Gracious Garland. Thank you for sharing this with us! I love everything about this store, from the etsy banner to calling a category "morsel adornments." Those centerpieces are amazing! I LOVE all their garlands. They are so adorable! I love the peppy toppers, but the pumpkin pom is perfect for the holiday season! I think the peppy toppers are really fun! The cake garland is amazing. What a great idea!! I love the embellishments you are giving away that can jazz up my "mommy uniform". But I also love her garlands for parties and holiday decorating. Fun! I've got the same daily uniform as you! I love the gold and pumpkin colours. I always mean to make my own fabric flowers but somehow the time just slips away on me! Its so hard to choose just one. The Holiday cheer is fun but I'm usually more practical and would choose a color that could go with almost anything. Thanks for the giveaway idea! I to am a jeans and t-shirt kinda of momma. I would love the flower pins to add some beauty to my day-to-day look. Well, I love to wear jeans & a tee too!! And my tees are usually variations of black, gray and white ;) So, I could really use some accessorizing :) I love the Embellish Collection (Berry) to add a little color to ma daily "uniform" :) Great find, Kristi! I've got your button too! The holiday pom is so beautiful. I am not sure; I like both the snow and the shadow colors! Oh these are wonderful! Love the Embellish in berry! I'm really into wearing berry and aqua together...this would be perfect on an aqua sweater!! What a great accessorie to anything. Love them all. adorable! 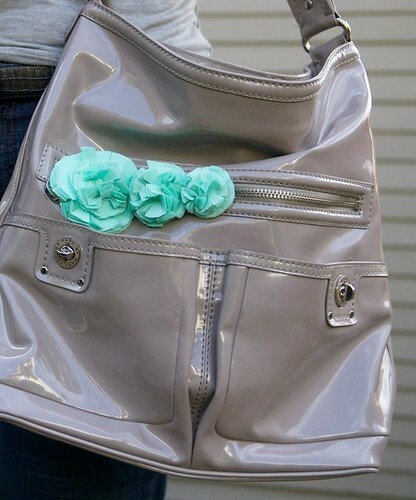 I love the embellish collection in mint! I love the embellish collection! The baker in me loves the Peppy Toppers...so very fun! I also like the embellish in berry. I love the garlands, especially the pumkin.